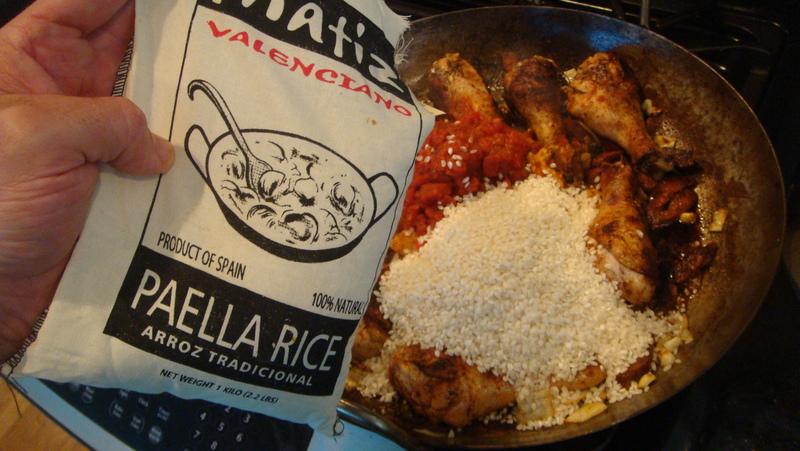 Soccarat: the elusive and ethereal crust of rice that forms at the bottom of the paella pan. Impassioned fans of the dish will literally fight over this, much in the same way as the impassioned football fans of FC Barcelona and Real Madrid. On the particular night in question, more than 16 years ago, we were so obliterated we had no idea what a soccarat was, or for that matter how to even make a proper paella without burning it. As mentioned previously, I did make a paella last week, and I did indeed pour a libation for my buddy Joe. So here, then, are some pics of the process. With the caveat that I made paella Valenciana from p. 134 of the book, here is also a splendid recipe for Barcelona style paella, courtesy Alberto Herraiz’s excellent treatise on the subject. 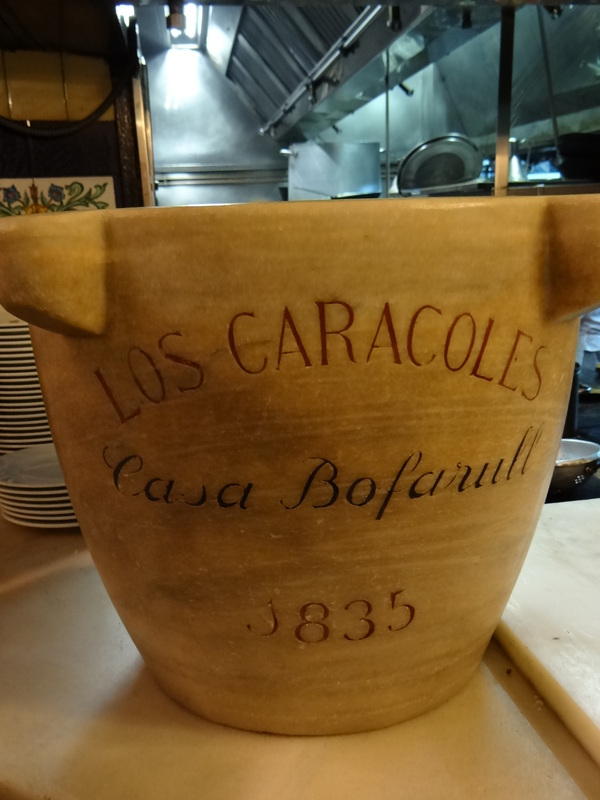 At the behest of our friends Josh & Nicola, my wife and I enjoyed Barcelona style paella at Los Caracoles on our second to last night in Spain. There, we met Brendan Perry from Dead Can Dance and got miracled to the sold out show the following night. 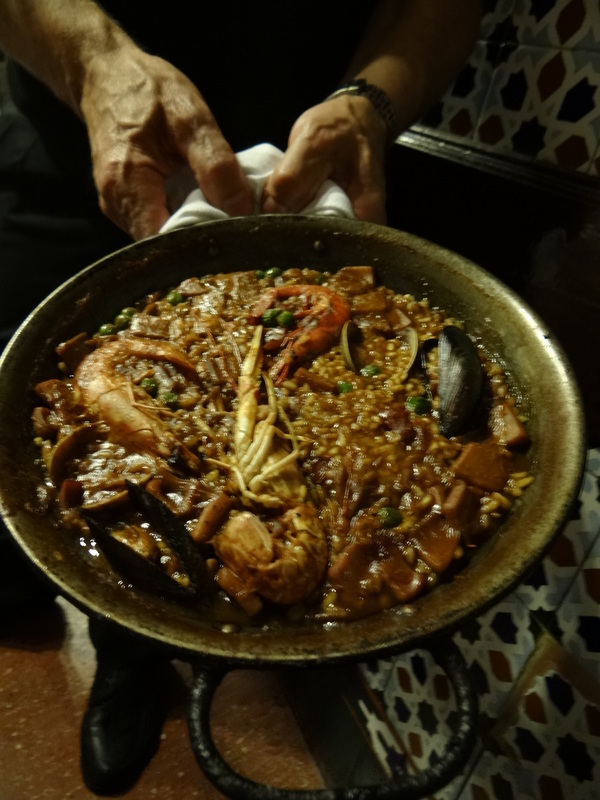 Our paella de Barcelona was a magical experience. This paella is made on Thursdays in the bars and neighbourhood restaurants (or casas de comidas) of Barcelona, where it is often the daily special. It is cooked on a large hotplate and is served straight onto plates. 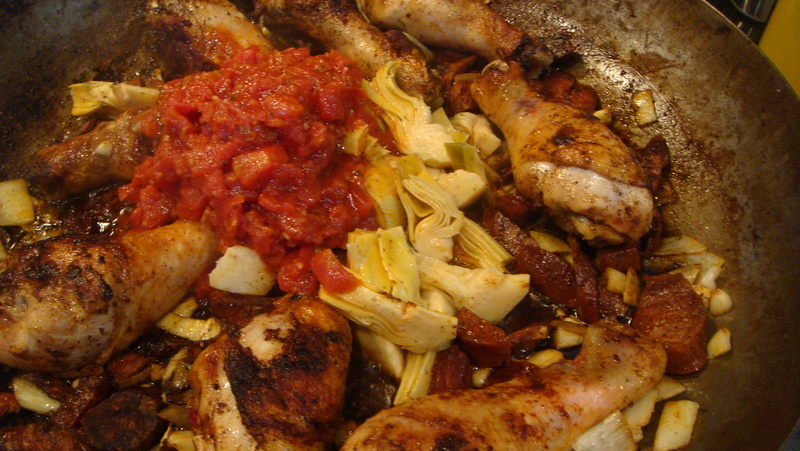 Use a pan suitable for use on the stove and in the oven. If you are short of time, good-quality ready-made fish stock can be substituted, although the result will be different. Preheat the oven to 150°C. Thoroughly rinse the fish bones and heads, and arrange in a layer in a roasting pan. Sprinkle with half the olive oil, and roast in the oven for 30 minutes until lightly browned. Towards the end of the roasting time, head the remaining oil in a large, deep pan or stockpot and add the leek, carrot, celery, fennel, onion and tomatoes. Gently saute until starting to soften and turn translucent, then add the garlic, bay leaves and nora pepper. Continue cooking over low heat until lightly browned; do not allow to burn. Pour in the white wine and deglaze the pan, scraping up any bits on the bottom with a wooden spatula. Once the alcohol has evaporated, add the browned fish heads and bones to the pan and fill the pan with cold water. Bring to a boil, then skim off any scum that has risen to the surface. Reduce the heat to low and simmer very gently, covered, for 25 minutes, skimming frequently. Meanwhile, toast the anise seeds and green peppercorns in a dry frying pan or skillet until fragrant. Remove the pan from the heat. Add the other spices and flavourings in a small bowl. After 25 minutes, remove the pan from the heat. Stir in the spices and flavourings. Cover and let infuse off the heat for 40 minutes. Using a ladle, skim off any oil that has risen to the top; remove any remaining oil by lowering a sheet of paper towel briefly onto the surface. Carefully strain the fumet through a fine-mesh sieve or chinois, without disturbing the ingredients that have settled on the bottom of the pan. Allow to cool completely and chill in the refrigerator until needed. An aromatic, flavoursome mixture cooked in olive oil, sofrito is the first stage of cooking paella. This recipe is for a versatile everyday sofrito and can also be used for many other recipes. Sofrito can be frozen in smaller batches to keep on hand ready for use. Heat the oil in a large pan over low heat and gently saute the onions until starting to soften (do not allow them to colour). Add the shallot and saute until it is also softened and translucent, then add the garlic and cook until the garlic is opaque. Next, add the capsicum, carrot and leek, and continue sauteing over low heat until these have softened and disintegrated. When the mixture has thickened, pour in the white wine and use to deglaze the pan, scraping up any bits on the bottom with a wooden spatula. When the alcohol has evaporated, add the tomatoes, rosemary and bay leaf. Simmer very gently over very low heat for 50 minutes, stirring occasionally. Season with salt and pepper, and add a pinch of sugar to conteract the acidity of the tomatoes. Remove the bay leaf and rosemary. Pass the mixture through a food or vegetable mill over a bowl, then push through a fine-mesh sieve or chinois, pressing it through well. It is not advisable to use a blender or food processor for this process because this incorporates air into the mixture and alters the colour of the sofrito. Taste and add more salt or sugar if needed. Allow to cool, then store in the refrigerator in a tightly sealed container. Heat the fish fumet but do not allow it to boil. Preheat the oven to 150°C. Bring a large pan of water to a boil, add the mussels and cook for 30 seconds, then drain them and set aside. Heat the oil in the pan over low heat, add the garlic and saute until lightly browned. Add the chicken pieces and saute for a few minutes until brown all over, then push them to the edge of the pan. Add the king prawns, langoustines, monkfish and squid and saute for a few minutes until lightly browned. Remove them from the pan and set aside. Add the green beans, peas and green capsicum strips to the pan and saute for a few minutes until the vegetables have softened. Reduce the heat to low, add the rice and cook for a few minutes, stirring with a wooden spatula, until thoroughly coated and translucent; do not allow the rice to burn. Add the tomato sofrito and stir the ingredients well, deglazing the pan by scraping up any bits on the bottom of the pan with a wooden spatula. 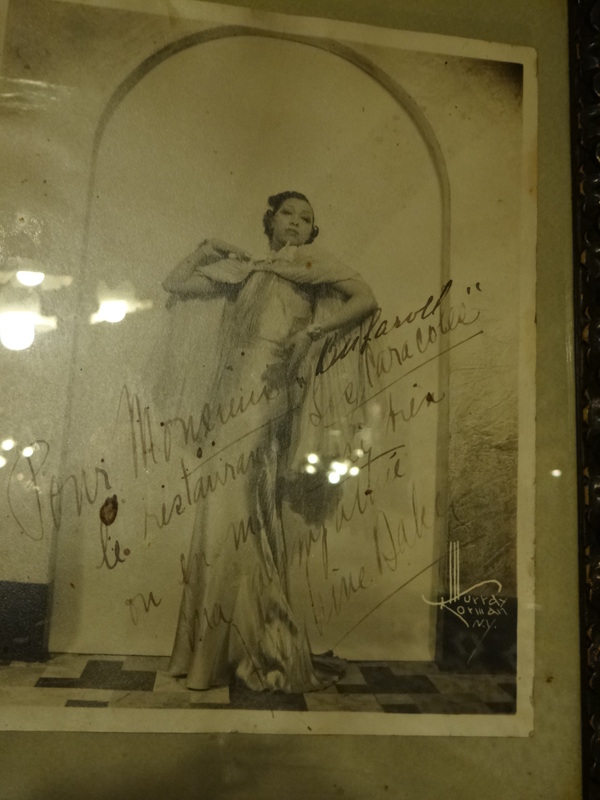 A signed picture of Josephine Baker at Los Caracolas. 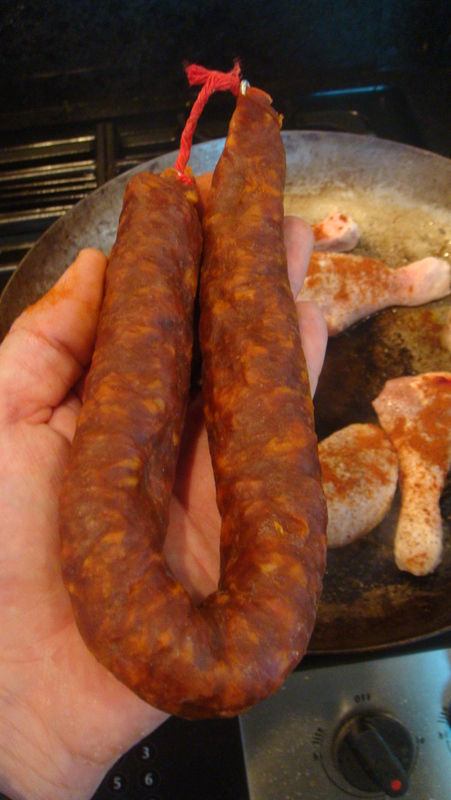 Add the smoked paprika, stir through and cook over moderate heat for a few seconds, taking care that it does not burn. Pour in the hot fish fumet, stir until combined and spread out the ingredients evenly in the pan. Add the saffron and grate the zest of the lime over the paella, and bring to the boil. If you have a timer, set it to 17 minutes. Cook over high heat for 5 minutes until the rice rises to the surface of the liquid. Taste and season with salt if necessary, bearing in mind that the flavours will become more pronounced as the liquid evaporates. Put the paella in the preheated oven for 9 minutes. Herraiz’s suggestion of the damp clean towel is no joke. I’ve attempted this a couple times, and each time have arrived at a perfect soccarat, the Spanish equivalent to the crust at the bottom of a bowl of dolsot bi bim bop. 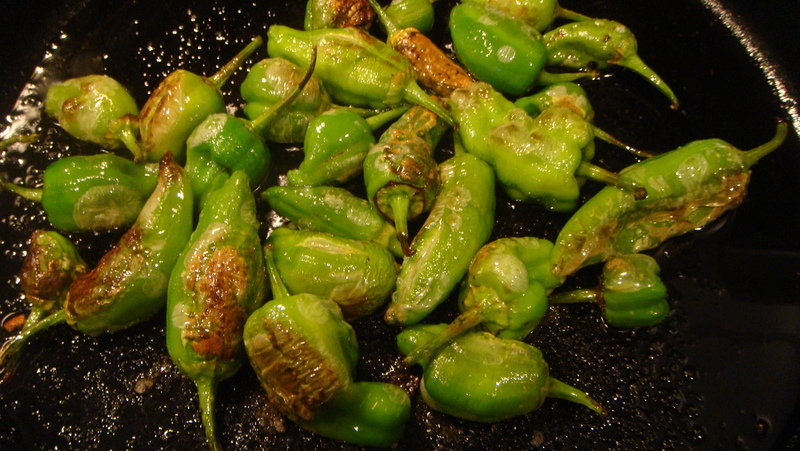 Aside from a lightly dressed salad, you may opt to serve this with some Padron Peppers, one of the few things (aside from Tortilla Espanola) we saw everywhere in Spain. Loosely equivalent to Japanese Shishito peppers, about 1 in 12 of these are hot. My family and I enjoyed our paella on our deck overlooking the marsh. My wife and I dreamt of Barcelona and a magic night in the Barrio Gottico.